Two of the best quarterbacks in the league have very different opinions on the role God plays in sporting events. Seattle Seahawks’ Russell Wilson made headlines this week not only for mounting an extremely improbable comeback to beat the Green Bay Packers’ in the NFC Championship game, but also for heading to church after the game. Not one to stand on the sidelines—unless it’s overtime—Packers’ quarterback Aaron Rodgers said that he doesn’t think God cares about the outcomes of football games. Speaking with ESPN Wisconsin’s Jason Wilde on Rodgers’ weekly radio show, Rodgers discussed the aftermath of the Packers’ NFC Championship Game loss to the Seahawks. A new PRRI/RNS survey found that most Americans agree with Rodgers. Only 26 percent of Americans say God plays a role in determining which team wins a sporting event, while 71 percent disagree. 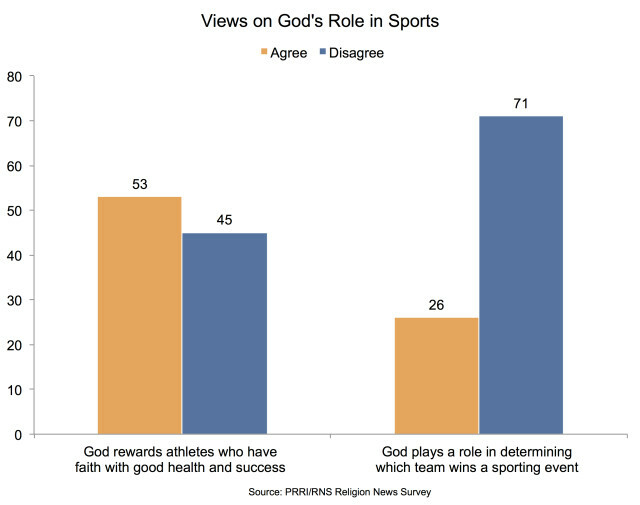 However, a larger number believe God may be playing a role in the success of religious athletes. A majority (53 percent) of Americans say God rewards faithful athletes with good health and success, compared to 45 percent who disagree.